We recently read in the media that Zimbabwe has gazzetted the Indigenisation and Empowerment Bill, which moves majority control of "public companies and any other business" to black Zimbabweans. I struggled to find the document on the web so I uploaded it here. In paying board members money to do what is effectively a charitable act, you are hoping to incentivise effort. However, as Sata correctly observes, doing so can have the negative incentive to prolong the process. The immediate solution is to create a definite end to the negotiating process. This has the additional advantage of also incentivising participating political parties [the non-board members] to reach a solution on negotiations quickly. However, that assumes the negotiations don't break down and get restarted again (or rather you can accurate foresee a "reasonable" time frame for concluding negotiations) - so effectively you could end up with a series of finite continuous games. What then is the solution? Well may be instead of worrying about creating a definite time frame, we should instead focus on ensuring that the board members are also negotiators. That way, their interest in reaching a solution would act as a lever to disentivise them from prolonging the process. Incidentally, its not necessary to pay them - since the incentive to conclude the process quickly would be enough incentive to work. Sata of course naturally discounts this solution because it corrupts the necessary fairness of the process. Hence PF's current opposition to Katele Kalumba's Chairmanship of the Board. And rightly so, since if Katele was a solution for the finite continuous games problem, then as we have seen its not necessary for him to get paid. The real solution to the problem of course is one which Sata himself identified last week - appoint independent board members already paid externally [whose source of income is derived elsewhere] and crucially for whom service is itself an incentive for hard work. These people should also be viewed as arbitrators/administrators by all sides. Only one group comes close to satisfy these conditions : Church leaders. A fascinating piece in the Times Newspaper on the positive changes taking place in Kitwe. Worth a read. The BBC Reports that "Zimbabwe has ordered factories and firms to cut the price of basic goods and services by up to half, in a bid to tackle rampant inflation". Apparently some economists think "that the measures are likely to lead to shortages, as companies either stop producing because they cannot afford to, or sell their goods on the black market". I think I am with these economists on this one - I am assume its the Oxfam/IMF/World Bank chaps. I say "I think" because these chaps still assume that the economy is functioning. As I have previously argued the concept of price is non-existent in Zimbabwe. Its now virtually a barter economy. But there's another reason for the hidden caution. Its because of late Zimbabwe is becoming a battleground among economists trying to out do each other. A step in the right direction on the children front. Media reports suggest that the "Government has now ratified the International Labor Organization (ILO) convention 182 on elimination of child labor". But also more importantly the Government is working towards finishing drafting the national child labor policy . Lets hope this will be subject to wider consultation, but more importantly the draft needs touche on the important issue of street children. You cannot deal with child labour in isolation from other issues. Hakainde Hichilema yesterday combined some familiar arguments for political funding (we have come to call these arguments "sakism") with his unique brand of economics (we have come to call this "hichilenomics") . Here is an excerpt from Saturday's Post Newspaper. He further supported the idea of funding political parties from state coffers. Hichilema said the people of Zambia should be involved in the bona fide political parties. He said if other African countries were funding political parties, the Zambian government could also manage. "We are not talking about extravagant spending. This is meaningful expenditure to make political parties professional. Let's start where problems start and we will then have a quality government," he said. Naturally, I don't accept that we should fund political parties just because other countries have managed to do so. Neither do I accept his suggestion that we should ask our poor people to fund political parties just to make these parties become professional. First, even for sakists, making political parties professional has never been their central rationale for party funding. They have tended to argue [incorrectly] that political funding leads to fair play. So hichilenomics is off the limb here from mainstream sakism. Secondly, how it is difficult to establish a direct link between provision of funding and a more professional political outfit. Just how will giving them more money make them more professional? Will they spend the money on business courses? Professionalism emerges out of the greater need to differentiate yourself from the rest of the competing bunch. Finally, and perhaps more worrying : to ask Government to subsidise political parties as a way of introducing greater political quality is not sound economics. Aside from the second point above, its also extremely counter intuitive. Its like asking Government to give more money to a poorly performing companies! He is saying parties are so poor at their jobs that they need more money to become better! The financial and material resources currently being wasted on sustaining the unproductive positions of Deputy Minister, Provincial Minister, Provincial Permanent Secretary, and District Commissioner could have been used partly on providing incentives and low-interest loans to small and medium-sized enterprises (SMEs). Merging of some of the government ministries which have similar functions would also free material and financial resources currently being allocated to the sustenance of meaningless ministerial positions. This piece reminded me of one of the major flaws in the current Mungomba Draft Constitution . Everyone knows that the optimal size of any Government is a fluid concept. Apparently not, according to the Constitution Review Commission. They prefer to stipulate the optimal size of Government for all occassions (see sections 152 - 157). The draft makes it clear that there should be positions of Deputy Ministers and Provincial Ministers. I would like to see some flexibility in the draft that allows any incoming Government to define for itself what it regards as the optimal size of Government - assuming it can justify those positions. Government structures need to be flexible and allow for positions to emerge as well as disappear. If Henry is right that some positions are indeed pointless, the current draft constitution does not provide the sufficient flexibility to allow the incoming Government to change things. A sentence or two needs to be added there to clarify things - better yet, the whole thing probably needs some revision. But thats another topic altogether! After decades of reckless economic mismanagement – including an official policy of printing money as fast as it can be done – dictated by President Mugabe, Zimbabwe has lurched into hyperinflation in the past few months. Annual inflation in May was at 4,500 per cent, according to official statistics, which are regarded as very conservative. A worrying extract from the Times Online article that reports that fuel supplies in Harare have all but dried up after service stations refused to accept the country’s wildly unstable currency in payment. It was reported last week that Zimbabwe has no more than six months before total collapse. It must be a different form of collapse in store because surely the economy has already collapsed. Zimbabwe is now a barter economy. Searchers are Zambians who are making a difference on the ground, and are not waiting for the Government to act. By this definition Enoch Kavindele must count as our latest searcher. His consortium North-Western Railways (NWR) has agreed a $250-million financing package with lenders from Britain, South Africa and United States to build a rail link in North Western Province. This is good news indeed, and could go some way to encouraging other Zambians to take the initiative and find creative ways of taking full advantage of the rapid development that is taking place in that part of the country. Sooner or later someone was going to do what Kavindele and others have done, it is good that it is a Zambian taking this initiative. Now let us hope the quality of service will be of the highest standard. Sophia Du Pleiss writes in a fairly recent paper on "Institutions and Institutional Change in Zambia". To strengthen its perceived control over the mining industry, the Government also decided to terminate all contracts for services with the foreign mining companies in 1973. It further decided to redeem all government bonds, despite the penalty of US$55 million. At that stage the Government had to borrow US$ 150 million on the Eurodollar market to finance these transactions, which all took lace under the euphoria that that income of the copper industry would remain at prenationalisation levels. Expectations that the mines under Government control would provide more revenues to the state proved misplaced. Not only did the cash flow position of the mines deteriorate, but the real copper price fell. Profits were not as high as expected, and must have had serious consequences for financing these loans. The result was that, except for a feeling of pride, the nationalisation offered small potential short-term gains for the Zambian Government, and left indebted. It could be argued that the extractive nature of the mining companies before independence allowed little income to trickle down to the Zambian economy as such. This, of course, provides no justification for the outright ownership of the copper mines, because taxing the mines the Zambian Government could have received an income to use on development projects in the country. If the government had accepted the suggestion by the United Nations and had fixed taxes at a nominal rate of 50 per cent, for example, it probably would have been the best long-term solution for both the industry and the country. The companies would have remained in control of the management of their properties, which was a very important consideration for obtaining loan finance, and taxes would have been at a level that international investors would have found attractive. I believe this statement carries an important warning from history in face of increasing pressure for resource nationalism that appears to be sweeping across the continent at the moment. According to Dr Kalombo Mwansa [Mines Minister] Zambia is on the verge of having atleast one for each province. It is set for what some are calling an "investment boom" this year. More information here. The time has never been more urgent to get the "correct" framework for leveraging mining profits into the economy. Zambia recently announced that we have it but we need to know the size of the reserves, now Ghana have confirmed that they most certainly have it and in abundance. Read more here. I am sure after the planned exploration, the oil reserves in Zambia will prove just reserves as big. Africa remains largely unexplored in this area. The question now on everybody's lips is not whether your favorite African nation has oil, but "have you found it yet?". One can only hope that as Africans we have now learnt that its not the abundance of your natural resources that matter, but how you use them. Botswana has shown that if the institutional frameworks are correct the "resource curse" can become a blessing. A new paper by Gero Erdmann "Ethnicity, Voter Alignment and Political Party Affiliation - an African Case : Zambia" concludes that by and large your Zambian tribe is the dominant factor in your voting choice. Apparently this is especially the case for those who tend to support UPND. To be fair to UPND the paper did also find that "the stronger the democratic attitude and the higher the formal education attainment of a person the more likely is a UPND vote". I'll let you be the judge on whether the analysis is robust or not. But its most certainly worth a read! Sakism: the thinking advanced by certain politicians that just because others are doing it, we should also do the same thing. Other people's actions are the best reasons for your own actions. "There was need for the government to fund political parties as a way of strengthening democratic governance in the country....There is consensus in the country and outside that there is need to support political parties to make them relevant and effective. This is happening all over the continent. I recently attended a meeting in Ghana where it was resolved to have state politicalfunding”. No Zambia does not need political funding, and neither should we ask our poor mothers and daughters to pay taxes just so that some politician in Lusaka could be given a platform to advance further “Sakisms”. Here the clarifying power of economics is most useful. For the economist the question is not what others are doing, but rather whether there is a strong economic rationale for doing it. Is there something that the “political funding" market is unable to do that possibly requires a visible hand of Government? And crucially can Government intervention in itself bring society to a higher welfare function? In other words can Government “fund” parties in such way that "moral hazard” issues and other things are avoided? It strikes that if a political party is well organised and has a clear vision there’s no reason why it should not get funding from interest groups. If a party is not getting funding it is mainly because the party lacks a coherent set of ideas and a believable platform. Of course I am assuming that there’s indeed “fair play” between parties in the nation that whoever has good ideas will get elected (to the benefit of those that bankrolled him). However if that is not the case, and “level playing” distortions exist they must come from the belief by political funders that the “incumbent” party cannot be unseated, and therefore it is pointless to fund any other party. Those beliefs are not ideological but possibly driven by observations of the constitutional framework that may give the incumbent greater hope of being retained compared to the opposition. But this is not really a failure in the funding market, it is simply an institutional problem that would be resolved if you had a more robust constitution that guaranteed “fair play”. Funding would therefore be the wrong remedy – the correct economic approach, and dare I say, cheaper solution is to provide a robust constitution that guarantees fair play. Media reports emerging this week suggest "Inflation is likely to bring Zimbabwe’s economy to a standstill within six months with the possible paralysis of President Mugabe’s Government and civil unrest". I am unsure what this form of "paralysis" will take. Some might say Zimbabwe is already in this state of paralysis. Indeed the same article quotes The Zimbabwe Doctors for Human Rights as saying last week: “It can no longer be said that the health service is ‘near collapse’, It has collapsed.” Can it really get worse than this? A previous edition of this blog provides references to the latest IMF academic work on the inflation situation in Zimbabwe. The Times of Zambia appear to have woken up to the housing related issues we have been discussing here. In that blog, I criticised the media for not holding Government to account on this matter. It may be coincidence but am glad they have picked it up today. [Actually to their credit, they also recently picked up on the social investment issue after much blogging here - albeit in a partial way]. "IT is common knowledge that Zambia faces a serious shortage of decent and affordable accommodation especially in urban and peri-urban areas. The situation was made more grave after the local authorities in the country were directed to sell off their housing stocks to sitting tenants under the National Housing Empowerment Policy introduced by the previous administration". "It is, therefore, our hope that housing bonds will help provide a solution to the accommodation shortage and local authorities too will take advantage to raise funds and build new houses when the bonds are finally launched. The private sector should move in and invest in this area because the demand for accommodation is evidently abundant and providers of mortgages should seriously re-look at the interest rates they slap on loans". As we have been discussing, this is just part of the problem in the housing market. Yes there's role for the invisible hand to move briskly, but also there's need for the visible hand of Government to think holistically. As the blog on housing policy suggests, these bonds aren't sufficient to meet our FNDP goals. But credit to the Editor for raising the issue and encouraging debate on it. Worth checking out MrK's Manifesto for Economic Transformation of Zambia. Its a radical proposal that will undoubtedly stir much debate. We have already had some debate on this here. I was skeptical last year about the oil and gas discoveries given the odd timing of the announcments (during a parliamentary contest in the relevant province). But now that the story is not dying away, I am filled with cautious optimism - could it really be true? According to Reuters, Magande seems to be planning a bidding round of companies already for "exploration". He is quoted as saying " we are now preparing the newspaper advertisement to invite interested parties to bid for the exploration on 25 blocks, and in the next few weeks or so we should be tendering for this". But then I am skeptical again. A part of me starts to hope its not true, because if indeed plans are offshoot on tendering for exploration, then announcing it at the "sidelines" of the World Economic Forum before the Zambian people are actually told of the plans, is not the correct way to proceed. A large percentage of our population do not have access to the web and hence have no idea of Government's immediate plans. If Zambia is going to do this properly and avoid the "resource curse" associated with oil and gas, we must be transparent from the start - information between the people and the Government is paramount. Equinox announced this week that they have identified further deposits of copper and uranium near its Lumwana Copper Project, which is presently under construction in Solwezi, North-Western Province. A copy of their press release can found here. This development also affords me an opportunity to bring the Mokambo news to your attention, in case you missed it last week. Our nation is truly blessed with enormous resources. Future generations will surely condemn this generation if these resources which are being found on regular basis now aren't fully utilised to the benefit of all our people. The key question of course, is whether the Zambian people are "benefiting" as much as they should. Some numbers released by Magande this week: "For the year 2005/2006, mining companies declared aggregate profit amounting to $397,299,045". Key word is "profit" not just revenues. The same news report says mineral royalties to Government amounted to around $9m (or K36bn) over the same period. Of course through all this we have to bear in mind that "benefit" is a much broader concept. “Zambia has been facing a very critical shortage of housing since independence. The lopsided pattern of development between rural and urban areas has resulted in very high rural-urban migration without a corresponding effort to provide appropriate housing in the expanding urban regions”. “The national housing policy was adopted in 1996 with the overall aim of providing adequate and affordable housing to all income groups in the country…to this end the Government liberalised the housing sector and provide an enabling environment to stimulate private investment in housing in order to proving more housing units to satisfy increasing demand. Lack of finance in the housing sector has, however, hindered satisfactory performance throughout the country”. “the ongoing efforts through the National Housing Authority, the Low Cost Housing Programme, formerly Africa Housing Fund project (AHF), and the introduction of the Municipal Bonds have the potential for improving the housing stock in the country”. a) The first aspect is the rural-urban migration problem that has generated pressure in the urban housing market. In other words, even if population growth was static we still face problems from rural-urban migration in urban areas, primarily induced by higher poverty levels in rural areas and high unemployment. Unfortunately, because this is a demand side problem as well, Government needs to think creatively on how to manage this problem and it does not just involve providing loans. It may for example require a government policy that actively places greater emphasis on moving jobs from urban areas to rural areas. This may be in form of a policy statement that "makes it a central Government policy to promote rural jobs before urban jobs". b) The second aspect is simply that many of our people are living in sheltered accommodation that is actually below human standards especially in the rural areas. There needs to be a policy agenda that addresses how you can provide low cost housing to these people. 100 houses per district as suggested in the FNDP will not solve this problem, neither does it make policy sense to still have a Government driven programme that has higher cost housing as a central feature. Another key area of course should be land reform, which could help local people use land as collateral to enable them to get credit to build houses. Unfortunately this is not even discussed. The linkages between housing and land are so obvious, yet the FNDP discussion on housing completely ignores the issue of land reform. Its almost as if housing is separate from the land it sits on! c) The third aspect is alienation from basic services even for those who live in good accommodation in rural areas. Although this is not strictly an “housing” problem, it is still pertinent since it relates to how well you can mobilise communities to ensure that there are within effective communities with access to basic services. Isolated villages are major issue in our rural areas and make it difficult to deliver any kind of development there due to remoteness. Credit here again is not the immediate solution. Rather better spatial planning intertwined with an effective housing strategy. d) The fourth aspect is affordability. Even for those middle income urban dwellers, the fact that our urban population is growing at faster rate than housing supply creates pressures of its own. Credit here possibly helps, but with a rising urban population credit may become expensive. The key here is perhaps to look at secondary cities and think about developing commuter towns. It seems again city planning may well the way to go. Although I concede that the recent development of special "economic zones" carefully planned with housing issues in mind may help, it remains to be seen to what extent housing policy as any bearing on their development plans. The second fundamental problem with the FNDP is that it appears to underestimate the scale of the housing problem. Yes it acknowledges that our situation is “very critical”, but just how critical is it? The FNDP does not explicitly tell us, but the clues are there : “The vision is to ensure 1.5 million people are adequately housed by the end of the FNDP (2011)”. The implicit suggestion is therefore that Zambia probably needs at the very least to generate 1.5m housing units for us to make some "progress". Starting from a 2001 base of 2.3m housing units this represents aspirations of housing supply standing at 3.8 in 2010 or an annual growth of 6% or just below over the horizon . I am not persuaded that housing growth of 6% moves us any closer to the solution. To understand why, we have to go back to the 1991 position. Zambia had 1.5m housing units in 1991 ; with the number of people living in the slums was around 2m [Source : UN Habitat]. Between 1991 and 2001, Zambia experienceda 5% annual growth in housing units, but the same period saw the number of people living in the slums continue to rise by 3%. So it seems that the growth in housing over the period simply fed new demand induced by population growth, and was in fact not sufficient to slow down the growth in slums. What the Government proposes in the FNDP is a 1% increase above and beyond the natural growth trend in new housing units between 2001 and 2010 (although the FNDP covers 2006, the housing targets are between 2001 and 2010), which won’t be enough to address the problem of inadequate housing supply. The number of people living in the slums will continue to rise and even if it slowed, we wont see any reduction in the number of people living in the slums beyond 3m. It may even reach something like 3.5m or beyond. It does therefore seem that the position in the FNDP does nothing to address the plight of people in our urban and rural areas, it simply tracks the current trend in housing growth. What Zambia needs is a “step change” in housing construction. The third fundamental problem with the FNDP is the most puzzling. Mainly because it represents an act of gross omission and illustrates a bankruptcy of ideas on the part of the authors. After telling us that we face a “critical shortage” in housing, and that most of it is due to “finance” it completely goes blank on where this source of finance can come from. The simple answer is that Zambia’s source of housing construction finance is the “direct foreign investment” coming into the country . Why not get the firms who are pouring millions into mines and tourism and other sector to actually be tied to spending some of it on housing? I am not talking about "mining renegotiations", rather a generic model that links new investment in areas to housing provision. The model that is needed is similar to the framework that the UK has adopted under Section 106 of the Town and Planning Country Act (1995). This UK legislation basically makes it a condition that any new investment in any local area of the UK should be conditional on providing some minimum level of investment in schools, housing, transport and other things, if the Local Authority deems necessary. What you can basically say is that if a firm X invests in Mpulungu, the people in Mpulungu can require that firm X to deliver not just investment but some houses and schools as well. But there has to be legislation to back them up! The advantage of such a system is that not only does it relieve pressure on local resources (meeting the "internalisation of externality" condition), but also helps tackle local poverty by linking the investment to the local needs such as housing. In addition, as well as helping us with funding our housing shortage needs, this system has an added advantage that it makes foreign investment in some areas publicly acceptable. Governments wants foreign direct investment, the people simply want good houses and better schools. And of course from an economic perspective such a framework also helps to raise the costs of reneging by the new investor by making it that much costly for him/her to cut and run, like others have done in the past! So we find that in this it’s a win-win for everyone, and most importantly it directly helps relieve the housing problem. Zambia has enormous land and cheap materials for housing. Whilst the use of market mechanisms like encouraging access to credit can work, sometimes we need a "visible" hand of Government. The tragedy of the FNDP on this issue is that it fails to think holistically about the different aspects of the problem and therefore zones in on one magic bullet – which is let us fix finance. No issues of land policy, leveraging investment through legislation or spatial planning policies are put forward. In the end the policy is no policy at all, because even the "aspirational" 1.5m additional dwellings brings us no where to call it progress. Its indeed puzzling that the FNDP appears to slip badly on a critical area such housing - but perhaps even more puzzling that the media in Zambia have not really pressed Government on the inadequacy of the FNDP proposals with respect to housing. On a question of where the current housing policy is taking us, I think the answer is very much "not very far". Saturday's IMF Press Release on Zambia blogged here, refers to Zambia's Letter of Intent to the IMF. You can find this here. My thanks to Gershom for bringing this to my attention. Today's BBC report that our brothers to the north are planning to review their 60 mining deals is likely to give a psychological push to those pushing for the same in our nation. I caution that perhaps our situation is slightly different - not least because DRC are starting from a bleaker economic and reputational position but also as noted in the report, DRC's case is unique in terms of "war and corruption" being the main reasons for the bad deals. This is echoed by the Carter Center assessment: "The tragedy of the many tragedies in the Congo was that the people woke up after years of war and found that the family wealth had been given away, or sold off, or at least as far as people knew, it seemed to have just flitted away." I was going to reflect on today's Post Newspaper editorial piece on Foreign investors but I found myself in too much laughter when I read the opening para! "It is very important that our political leaders talk about things they are very clear about. It is not good for top political leaders to start making absolute statements about things they least understand. They should not try to explain that which is not perfectly clear to them"
The inference drawn that the Post Newspaper knows better! I simply posit that the article is relevant to the discussions we are having here. The Zambian blogsphere continues to grow. Happy to announce Gershom Ndlhlov's new blog. He has some interesting perspectives on regulating presidential gifts. Mulongotism : "the irrational fear that the privatization of an inefficient state- owned enterprise would damage our fragile economy". A recently diagonised syndrome, whose roots can be traced back to the pain our nation went through in the early 1990s, when a well intended liberalisation of our economy was poorly executed pushing more of our people into poverty. Zamtel needs more than an "injection of more energy" as Mr Mulongoti's would have us believe. Zamtel's de facto monopoly in the international segment (because of a prohibitive license fee it charges) should surely cease, because it is actually inefficient in itself and because it is inhibiting the expansion of all other telecommunications market segments. Profits from the international segment have not found their way to financing the expansion of the rural network; rather they cross subsidise services for our urban people that are already in possession of a phone line and for Government departments that do not pay their bills. At the same time time, Zamtel's monoplogy inflicts losses upon mobile service providers that must use its gateway, depriving them of resources that could have been invested in the expansion of their networks. Discriminator practices in internet access undermine growth of other dynamic companies as well! Recent World Bank estimates actually suggests that full competition could provide another 30,000 of our people with access to fixed-line telephones, and the gains in the mobile access could be comparable. So I say let us tackle this syndrome head on! "The Zambian authorities are to be commended for pursuing sound macroeconomic policies that have sustained robust economic growth and achieved a marked reduction in inflation. High copper prices and extensive debt relief have helped to strengthen Zambia's external position and allow a build up of international reserves. "Going forward, the challenge for the authorities is to consolidate macroeconomic stability and implement structural reforms to raise productivity and diversify the economy. Continued prudent fiscal policy is needed to restrain the growth of government domestic debt, while monetary policy will need to remain firm in the months ahead to keep inflation on a downward path. Better coordination between fiscal and monetary policy will help improve liquidity management. "It will be important to press ahead with tax reform to broaden the tax base while making the tax system simpler, more efficient, and equitable. Higher levels of tax revenue will be required over the medium term to accommodate spending on infrastructure, agriculture and the social sectors as envisaged in the Fifth National Development Plan". What would you do if you had £40m each year for mother Zambia? Well apparently that's how much Britain will give Zambia each year for the next 10 years. One can only hope that this is new money, better yet a "free" lunch. Actually, I hope it is new but not given freely. Isn't this a great time for Britain to think outside the box and consider the possibility of converting this "new cash" into long term Kwacha bond claims of Zambians on the Zambia Government? I can hear you say, "what"? Well I think such a move would restore much needed accountability in our system as well as strengthening our debt management practices. For example you could allocate a share of the bonds to civil servants as part of civil service pay increase and so forth. Then we wouldn't have to worry about whether Mr Mutati means it when he says "the money would be used prudently and transparently for the benefit of the people of Zambia". On the blog A new Government bank for farmers? I mentioned information from the chart above and other facts related to constraints on financial access for smaller firms. This information is drawn from a brilliant and fairly recent world bank policy paper on "Access to financial services in Zambia". Its well worth the read for anyone interested in understanding the current level of acess to financial services. It also has some interesting observations on why "liberalisation of the banking system has not delivered the benefits" - and the potential lessons that holds for Zambia. Like most World Bank papers, its full of proposals on what Zambia must do to promote access to financial services. Some fun test. I got this political test from one of my favorite economics blogs. The test measures your views on the right/left and authoritarian/libertarian axes. The results section plots where you stand and you can see where you stand relative to contemporary and historical figures. 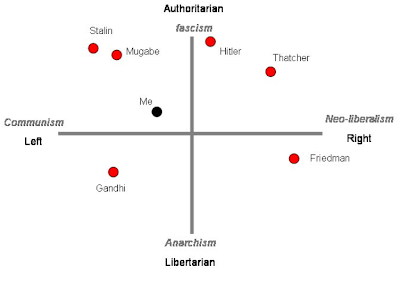 It turns out I am an authoritarian lefty - but still a good distance away from Bob and Stalin! Prior to the test, I would have thought I was slightly centre right. Oh well...I would be interested to know yours (only takes 5 minutes to do). The Economist Magazine this week lauched a study ranking 121 nations by their 'absence of violence.' The 24 indicators include internal and external factors such as levels of violence within a country, organized crime, the number of people in prison, and military expenditure. A number of Nobel laureates, including one of my favorites Joseph Stiglitz, backed the study which puts Zambia as the 6th most peaceful nation in Africa, and 53rd overall. If investors are looking at these sorts of stuff and wondering where their investments would be safer in Africa, I think the index says Zambia is the place to be - don't you? For a complete ranking click here. We have been discussing a lot of issues related to empowerment and foreign ownership. 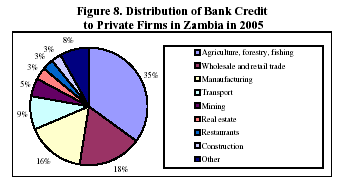 But what we don't really know is the extent of foreign ownership in Zambia - as in real hard data. We know what is happening to the mining sector, but how far widespread is the level of foreign ownership across the economy? 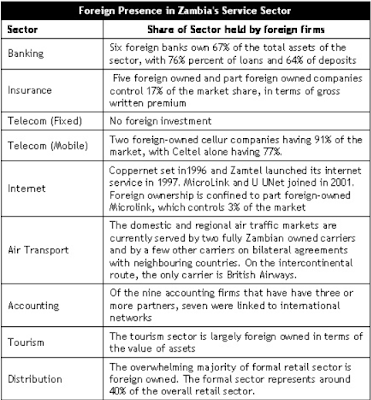 How much is really owned by Zambians and foreigners across the board? A few shops at Manda Hill and Arcades may not translate in foreign dominance - or do they? It would be useful to have information in this area. I think this is crucial for a number of reasons. We need to know whether the current level of foreign ownership is significant to warrant concerns across the board (economic security concerns). We want to look at those sectors in which foreign presence is dominant, and assess the added value it has brought in terms of jobs, stability and generally contributing to our social and economic development goals. We want to compare how the sectors where Zambians are dominant already are doing relative to the sectors where Zambians aren't dominant. We also need to check these things with an eye on the "strategic sectors". For example agriculture is a strategic area because to paraphrase that wonderful author Ron Macher the smaller % of our farming population feeds the larger and hungry. In short, we want to have a rational debate about whether foreign ownership has brought benefits in some areas or not, and crucially what we would like to happen over the long term. In the absence of Government Green and White Papers, its the citizens who should hunt down information and educate themselves. So to help towards this cause, I have dug the table above on the service sector level of ownership - courtesy of the folks at the World Bank. I got the service sector data because it was easier to do so, and also because nearly 64% of GDP is now generated by services. So its not a bad place to start. The data on services above is not comprehensive, but it is a start. The search continues for more data and also to paint a similar picture for non-services (mining and the like). If others are aware of the sectoral map, i would be interested to see the information. More "Equinox" salt for that wound? "Equinox aims to produce an annualised 200,000 tons of copper a year by this time next year. Current price levels for the stock suggest a long-term copper price assumption of around $1.65 a pound, just more than half the current spot copper price. The sweet part of this story is that Equinox's uranium resource is essentially for free. The figures start with Equinox owning around 20m pounds of uranium, sitting within its Zambian copper ore bodies. The uranium leg of the operation could be in business by 2010 for a capital cost of around $200m, and a fair-guess operating cost of less than $20 a pound. Using current spot uranium prices of around $125 a pound, and annual Equinox production of 1.5m pounds or uranium, "Equinox Uranium Corporation" would generate cash flows of some $150m a year. Uranium producers such as Cameco and Energy Resources Australia trade on actual cash flow multiples of ten times and more. A couple of multiplications, and it can be argued that Equinox's entire market capitalisation of C$1.8bn can be justified on its potential uranium production. For those investors still bullish on copper, Equinox's projected annualised production of that metal would produce cash flow of close to $1bn over 12 months, given current spot copper prices. The story is quite different to a good number of "hopeful glow-in-the-dark uranium developers", and takes on further promise considering that Zambia's copper belt comprises a huge brown fields copper rehabilitation site. Mining and civil infrastructure is already in place for a number of copper producers, a story enhanced in its own right by substantial re-developments underway across the border on the contiguous Democratic Republic of the Congo copper belt."